As with any vehicle, we recognize that every customer has their own preferences for the drone (UAV) platform they like to use. The Routescene® UAV LiDAR system has been designed to fly on any aerial platform that can carry a payload of 2.8 kg. The total weight of the system is just over 2.8 kg including the LidarPod, the UAV mounting kit, cables and GNSS antennas. 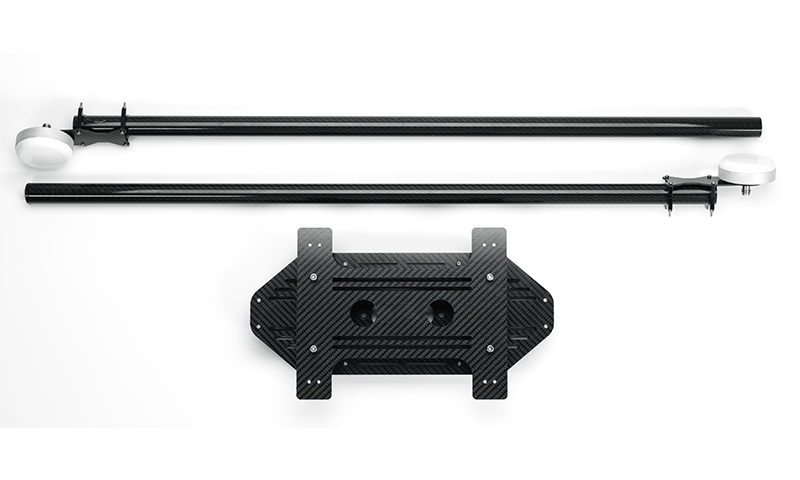 Our carbon fiber vibration damping mounting kit for the LidarPod is lightweight and has been developed for easy integration on any rotary drone (UAV). Specially designed and tested for ease of use and to reduce vibration from the UAV, the mounting kit includes an equipment plate which is compatible with 12 mm diameter UAV equipment rails, the 2 rails being 150-155 mm apart. The equipment plate can easily be modified or redesigned to integrate with the mounting system on your chosed drone. The equipment plate includes quick release clamps for easy deployment. The LidarPod requires power to be supplied to it directly from the drone or from a stand-alone battery – the power supply to use will depend on the user’s preference and the battery management system on the drone. The LidarPod can support a wide voltage range input (11-48VDC) to make it compatible with high powered drones which utilise 48VDC to minimize power losses. The LidarPod requires power to be supplied via a XT60 connector, this being a standard plug for most drones. The LidarPod uses a dual antenna GNSS\INS system to ensure that the heading accuracy is as accurate as possible. A recent analysis of single antenna GNSS\INS systems on the market concludes that a dual antenna system is up to 10 times more accurate (Heading). This heading accuracy gain ultimately ensures that the final point cloud is also more accurate. The LidarPod uses two lightweight survey grade GNSS antennas which are optimised for dual frequency GPS and Glonass signals, are tuned to ensure optimum RTK performance and are designed to withstand extreme conditions. The antennas are supplied with aluminium plates to act as ground planes, further enhancing performance and reducing multipath.